The capital city of India, Delhi is blessed with innumerable places which cater to the needs of every type of tourist and traveller. From history lovers to architecture enthusiasts, nature lovers to photographers and picnickers to offbeat travellers, it interests everyone. So, how is it possible for this metropolitan city to not host places where one can hangout with friends? Certainly, it is objectionable if you find any place in this entire world without hang out spots. Being one of the largest cities in the world, one would assuredly expect Delhi to harbour alluring places where one can spend quality time with friends. Following are such places in Delhi which are so lively that they are perfect hang out spots. Read on to know more about them. Surrounded by beautiful parks and dotted with lively restaurants and cafes, Hauz Khas is a locality in southern Delhi and is a perfect place to hang out with your friends, especially if you all desire to meet over lunch or dinner. The beautiful markets and colourful shops add to the existing charm of the place. On one hand, you can enjoy an appetising dinner in its dynamic cafes and on the other hand, you can just laze in its beautiful parks and chit-chat with your friends as you traverse its sparkling markets. If you are looking to enjoy the best of environment at Hauz Khas, then it is advisable to plan your meeting after 5 pm. Where else can you spend quality time with your friends other than a garden? If you always look forward to avoiding a crowded environment and desire to spend a few hours away from the noisy city life amid seclusion, then Lodhi Gardens is your spot. Covered with squashy grassland and dotted with ancient monuments and beautiful trees, Lodhi Gardens is also an ideal spot to relax and find peace. Wouldn't you love to get your pals to this peaceful spot and enjoy a relaxing time with them? It would be more fun exploring the historic monuments of Lodhi Gardens with your friends and learning about the history of India. 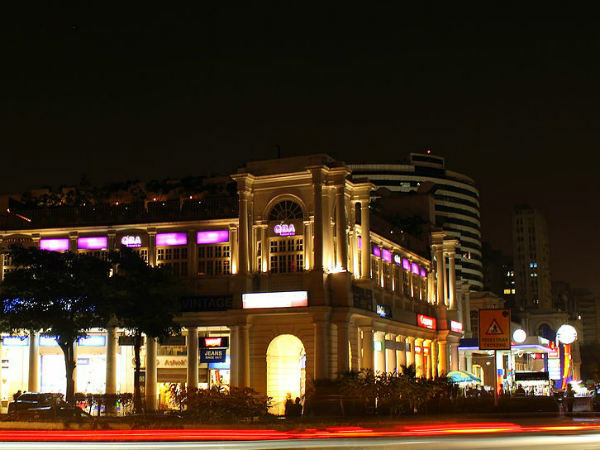 One of the oldest parts of Delhi, Connaught Place is not only a hangout destination but also a tourist spot. Such is the importance and majesty of this age-old setting that it has been captured in several documentaries. Even though this age-old complex has developed into an urban locality over a period of time, you can still feel the pulse of Old Delhi as you cross its beautiful shops, fashionable stores and lively streets. You can also enjoy the local cuisine in its restaurants. There are several shops and restaurants which are open until midnight, thereby, making this place the liveliest of them all. So, how about spending a few moments with your chums in the vibrant atmosphere of Connaught Place? Who would mind a discussion with their friends over a cup of tea? Well, if you are looking for such places where you can just chill and relax with your pals as you take a sip of tea, then do visit JNU Ganga Dhaba. It is a small cafe located inside the JNU campus and is always filled with students from different streams having discussions over different subjects, ranging from politics to humanity and literature to economics. Doesn't it seem lively? Well, it is. You cannot find such an amazing place elsewhere in Delhi where the surroundings remain youthful throughout the year. So, what do you think about being a part of this beautiful environment this weekend? An ultimate stoppage for a foodie, especially a paratha lover, Paranthe Wali Gali is an old locality in Delhi and is known for its fine restaurants and cafes where you can taste the best of stuffed paratha and other local dishes. Filled with the aroma of savoury spices, this tempting spot will certainly get your mouth watering and compel you to stop for a bite. How about a meeting your pals over a cup of tea and a plate of paratha? Paranthe Wali Gali is all set to give everlasting memories. So, do not miss out on this wonderful spot where you can spend the best of your weekends with your friends.